The DRIFTERS PROJECT, begun by Pam Longobardi in 2006 after encountering the mountainous piles of plastic the ocean was regurgitating on remote Hawaiian beaches, has worked directly through local sponsorship, small grant support and personal expenditure by cleaning beaches, making art and working with communities in Beijing, China (NY Arts Beijing, 2008); in Atlanta, Georgia (New Genre Landscape, 2008); in Nicoya, Costa Rica (Chorotega Sede/Universidad Nacional, 2009); in Samothraki, Greece (EVROS Cultural Association and PAI 2010); in Monaco (Nouveau Museé National de Monaco 2011); in Seward, Alaska and Alaskan Peninsula, Katmai National Park as part of the GYRE Expedition (Alaska SeaLife Center 2011, Anchorage Museum 2013-4 and CDC Museum in Atlanta, 2015); in Kefalonia, Greece (Ionion Center, 2011, 2012, 2013, 2014) with the 2014 birth of Plastic Free Island, and in Armila, Panama in collaboration with women artists of the Guna Yala community there. Longobardi and the Drifters Project was recently featured in National Geographic, commissioned for the cover of SIERRA magazine, and was a guest on the Weather Channel. Longobardi is Distinguished Professor at Georgia State University in Atlanta and Artist-In-Nature for Oceanic Society. THE CONSCIOUS OCEAN proposes a collaboration between art, science, activism and like-minded groups that begins with the assumption that the ocean is a conscious entity that, in many different ways, from rising levels and temperatures to declining fish stocks to coral bleaching and finally to the deformed material plastic objects that float the world round, is attempting to communicate its declining state of being. The CONSCIOUS OCEAN also proposes that, though geo-political boundaries and naming have created numerous different ‘oceans’ and ‘seas’, it is ONE WORLD OCEAN, one continuous, flowing, interconnected liquid entity. Pam Longobardi’s parents, an ocean lifeguard and the Delaware state diving champion, connected her from an early age to the water. She moved to Atlanta in 1970 and saw her neighborhood pond drained to build the high school she attended. Since then, she lived for varying time periods in Wyoming, Montana, California, and Tennessee, and worked as a firefighter and tree planter, a scientific illustrator and an aerial mapmaker, a waitress and a bartender, a collaborative printer and a color mixer. Her artwork involves painting, photography, and installation to address the psychological relationship of humans to the natural world. She has shown her artwork across the US and in Greece, Monaco, Germany, Finland, Slovakia, China, Japan, Italy, Spain, Belgium, Costa Rica and Poland. She currently lives and works in Atlanta and is Professor of Art at Georgia State University. Presently she drifts with the ongoing Drifters Project, following the world ocean currents. 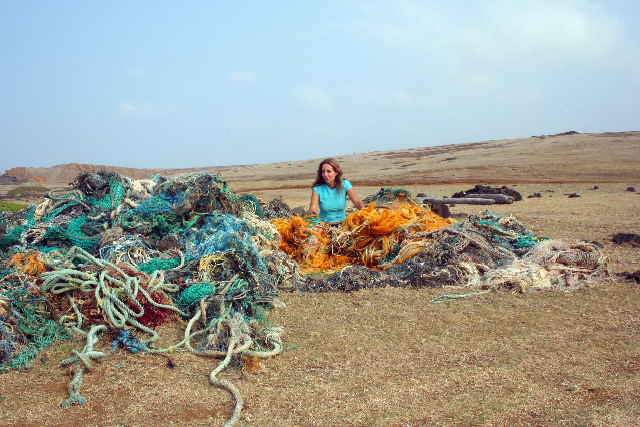 With the Drifters Project, she collects, documents and transforms oceanic plastic into installations and photography. 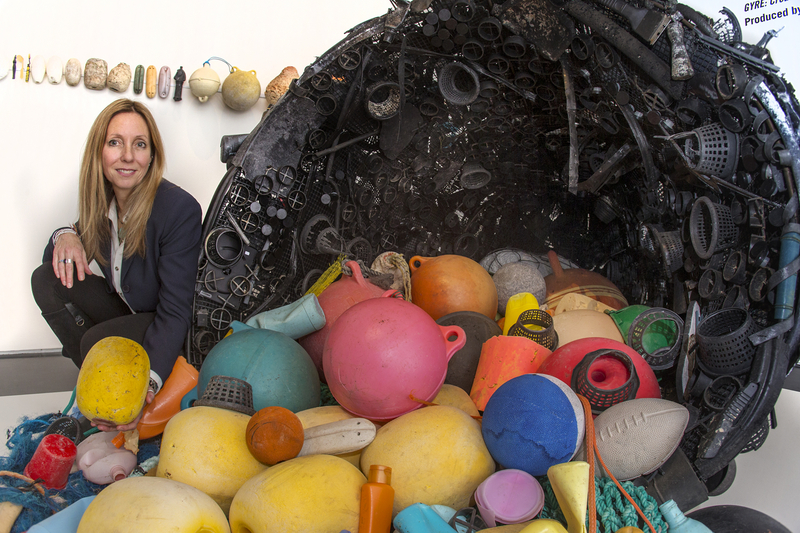 The work provides a visual statement about the engine of global consumption and the vast amounts of plastic objects and their impact on the world’s most remote places and its creatures. Longobardi’s work is framed within a conversation about globalism and conservation. Longobardi participated in the 2013 GYRE expedition to remote coastal areas of Alaska and created project-specific works for the exhibition at the Anchorage Museum February 2014. 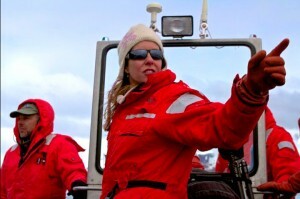 Longobardi was featured in a National Geographic film on the GYRE expedition and her Drifters Project was featured in National Geographic magazine. Also in 2013, Longobardi created a site-specific installation for a special project of the Venice cultural association Ministero di Beni Culturali (MiBAC) and the Ministry of Culture of Rome for the 55th Venice Biennale, on the Island of San Francesco del Deserto in the Venetian Lagoon, a work made from plastic water bottles, mirrors and a satellite dish that signaled an apology to St. Francis across the lagoon to the island of Burano. She exhibited photography in Seescape at George Adams Gallery in New York, and won the prestigious Hudgens Prize (2013), one of the largest single prizes given to an artist in North America. She has an ongoing collaboration supported by the Ionion Center for Art and Culture in Metaxata, Kefalonia, Greece. In 2014, Longobardi was awarded the title of Distinguished University Professor, and has been named Oceanic Society’s Artist-In-Nature. IN 2006, after discovering the mountainous piles of plastic debris the ocean was depositing on the remote shores of Hawaii, I began collecting and utilizing this plastic as my primary material in my project called Drifters. Since then, I have made scores of interventions, cleaning beaches and making collections from all over the world, removing thousands of pounds of material from the natural environment and re-situating it within the cultural context for examination. These collection missions were originally done solo, as part of my process, but soon grew to encompass thousands of people in hundreds of global sites. I approach the sites as a forensic scientist, examining and documenting the deposition as it lay, collecting and identifying the evidence of the crime. Plastic objects are the cultural archeology of our time. These objects I see as a portrait of global late-capitalist consumer society, mirroring our desires, wishes, hubris and ingenuity. These are objects with unintended consequences that become transformed as they leave the quotidian world and collide with nature to be transformed, transported and regurgitated out of the shifting oceans. The ocean is communicating with us through the materials of our own making. The plastic elements initially seem attractive and innocuous, like toys, some with an eerie familiarity and some totally alien. At first, the plastic seems innocent and fun, but it is not. It is dangerous. We are remaking the world in plastic. In keeping with the movement of drift of these material artifacts, I prefer using them in a transitive form as installation. All of the work can be dismantled, reconfigured but nearly impossibly recycled. The objects are presented as specimens on steel pins or wired together to form larger structures. I am a conceptual artist with a strong affinity to materials and process. I was trained as a painter and printmaker, and continue this in my studio practice, but have always worked in varying mediums from photography to painting and collage to installation, allowing the ideas to dictate the materials I work with. I am interested in the collision between nature and global consumer culture. Ocean plastic is a material that can unleash unpredictable dynamics. I am interested in it in particular, as opposed to all garbage in general, because of what it reveals about us as a global culture and what it reveals about the ocean as a type of cultural space, as well as a giant dynamic engine of life and change. As a product of culture that exhibits visibly the attempts of nature to reabsorb and regurgitate this invader, ocean plastic has profound stories to tell.